Dr. Pimsleur's extremely accessible and successful program teaches you language in the same way a native speaker would-through exposure to everyday, normal conversations. Instead of chopping up a foreign language into a little but of grammar with a dash of vocabulary, he presents the language as a complete course. And rather than memorizing repetitive drills that only dull learning, Dr. Pimsleur's "input/output" system of learning actually challenges your brain. By teaching information, and afterwards asking you to recall what you've learned, your brain transitions the language from short term to long term memory, leading to successful fluency. This course is audio based; 5 CDs are included with two 30 minute lessons per CD. There are no workbooks and notetaking is discouraged as speaking and listening is emphasized. CDs come in a black, zippered CD case. This course teaches what is known as "Eastern Arabic", which is primarily spoken in Syria, Lebanon, Jordan and Palestine, but is well understood throughout the Arabic speaking world. This course includes Lessons 1-10 from the Arabic (Eastern) Level 1 program - 5 hours of audio-only effective language learning with real-life spoken practice sessions. Get a chance to test drive the incredibly effective and efficient, world-famous Pimsleur Level 1 Program. Each lesson provides 30 minutes of spoken language practice, with an introductory conversation, and new vocabulary and structures. Detailed instructions enable you to understand and participate in the conversation. Practice for vocabulary introduced in previous lessons is included in each lesson. The emphasis is on pronunciation and comprehension, and on learning to speak Eastern Arabic. Arabic is the world's 6th most common language with 295 million native speakers. It is also the liturgical language of 1.6 billion Muslims as it is the language of the Qur’an, the holy book of Islam. Eastern Arabic is the dialect spoken in Syria, Lebanon, Jordan, and Palestine. Eastern Arabic is also very well understood in the eastern and southeastern parts of the Arab world -- Arabia, the Gulf Region, and Iraq. 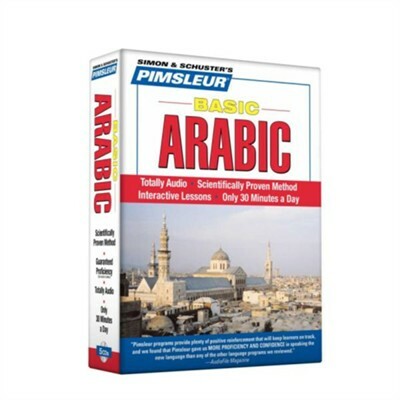 Pimsleur’s Eastern Arabic is based on the dialect of Damascus, Syria. I'm the author/artist and I want to review Basic Arabic:Totally Audio Compact Disc.